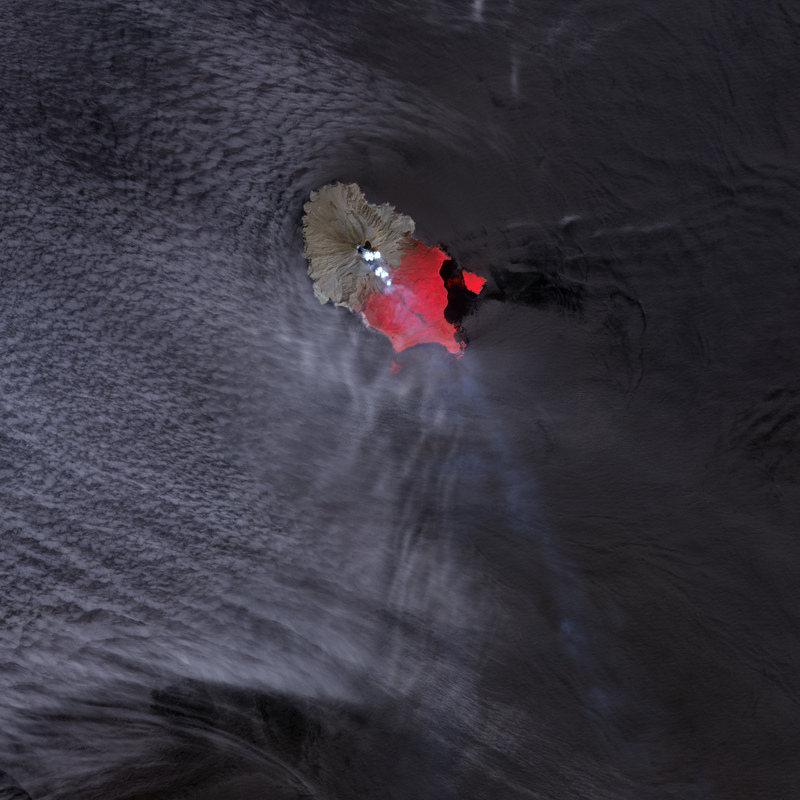 On June 12, 2009, Sarychev Peak on the Kuril Islands’ Ostrov Matua experienced a spectacular eruption. The event left behind a changed island. 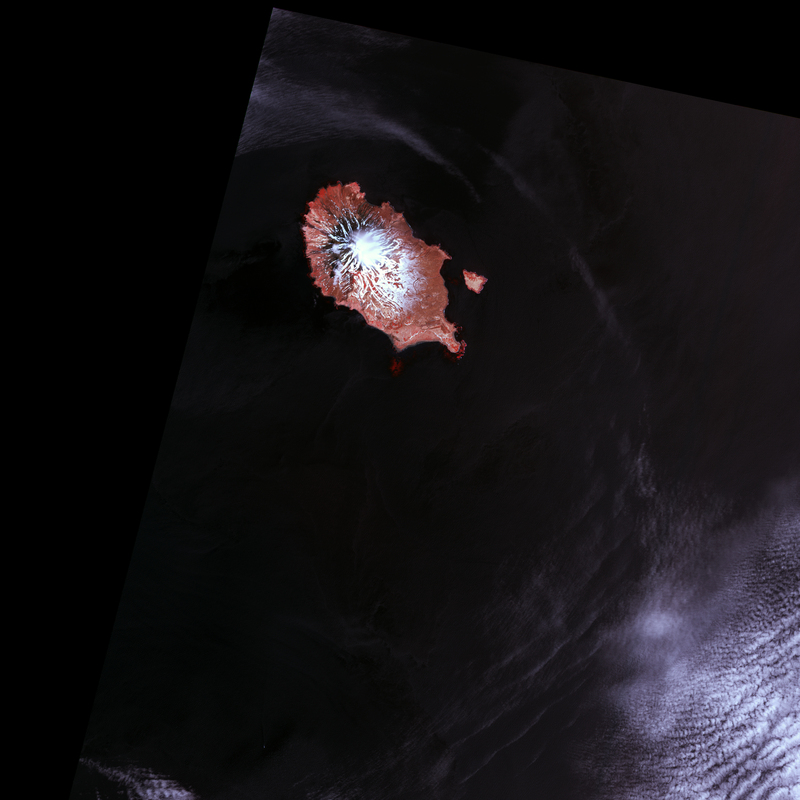 Acquired by the Advanced Spaceborne Thermal Emission and Reflection Radiometer (ASTER) on NASA’s Terra satellite, these images of Ostrov Matua show the island shortly after the eruption on June 30, 2009 (top), and two years before on May 26, 2007 (bottom). In these false-color images, vegetation appears red, water appears dark blue, and clouds, water vapor and ice all appear white. Volcanic rock, including old lava flows and debris from the recent eruption, ranges from gray to dark brown. The most striking difference between these two images is the gray coating on the northwestern half of the island in June 2009. 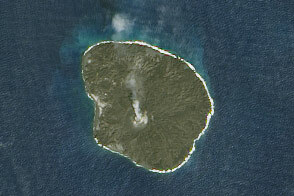 While vegetation on the rest of the island appears lush, volcanic debris—probably a mixture of pyroclastic flows and settled ash—covered virtually all the vegetation on the northwestern end. 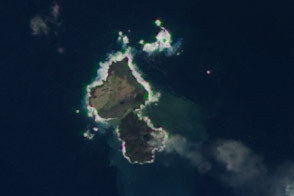 A close look at the top image also reveals that the recent volcanic activity appears to have expanded the island’s coastline on the northwestern end. Another difference between the images relates to snow cover. 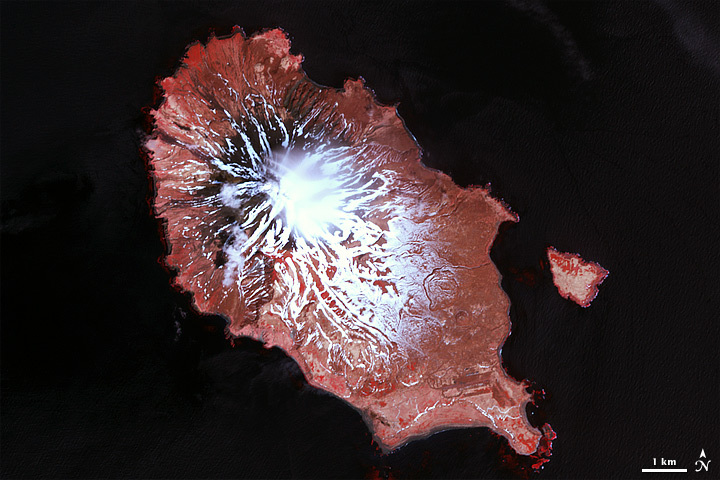 In the image from May 2007, snow spreads over much of the island, although the snow alternates with snow-free ground. The vegetation is pinkish-gray, suggesting the spring thaw is still underway. The complete lack of snow in 2009 may result from a combination of a difference in season and volcanic activity having melted or covered any lingering snow. A pair of before-and-after images shows how the June 2009 eruption of Sarychev Peak Volcano transformed Matua Island. 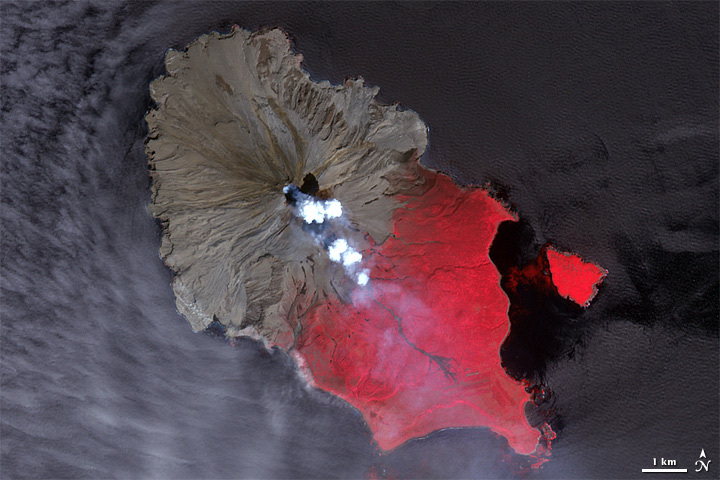 Sarychev Peak in the Central Kuril Islands released volcanic ash plumes and a large cloud of sulfur dioxide in early June 2009. The volcano was intermittently active over the following year.